Are you looking for the best cordless electric chainsaw? Cordless chainsaws are useful for general garden maintenance, and they can also be used for professional tree felling duties. A cable free chainsaw provides you with more freedom to cut where you want, how you want, without worrying about running out of cord line. When you buy a cordless chainsaw, you will have a few considerations to take into account. You need to think about battery runtime, ease of use and general handling. Choosing the right chainsaw will be determined by what you’re going to use it for. We’ve reviewed a few of the best chainsaws under two hundred dollars on the market for you to consider from the biggest brands. This chainsaw can be bought with a 40V lithium battery to maximize the runtime. It’s design provides an automatic oiling system for the low-kickback bar and chain. As well as this the chain can be adjusted without tools, making it quick and easy to alter based on your own preferences. 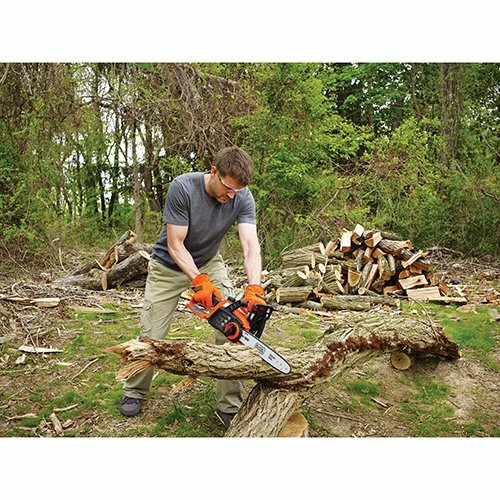 With a twelve-inch cut capacity, the chainsaw is designed to be both lightweight and easy to use. It should cut through both drywood and live trees due to the power behind the large saw. One of the big benefits of this chainsaw is that it charges relatively quickly. You can get a full charge in just forty-five minutes, and that will last the same time during heavy use. For smaller jobs, you might find that the battery lasts longer. 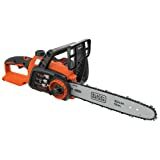 Due to the power behind this chainsaw, you should find you can easily cut through larger trees with no trouble at all. Since it does have a lightweight design, you won’t find larger jobs like this difficult at all. However, the lightweight Black and Decker is prone to oil leaks which means top ups are frequent. The chainsaw doesn’t seem to have been constructed as securely as you might expect from the brand. Parts come apart easily, and the lightweight design means that it could break with regular use. The relatively short battery life may also be an issue for heavier jobs and larger trees. Still if you’re choosing battery power over gas or corded electric the chances are you’re just using for smaller pruning tasks. In which case the battery life might not be an issue. Ultimately, the chainsaw offered by Black+Decker is good value for money for what it is. However, despite being light enough for longer jobs the battery life is quite short, and the issues with oil could be a nuisance after several uses. Thus despite its notable power, this saw is really only useful for smaller jobs around the yard like splitting firewood. 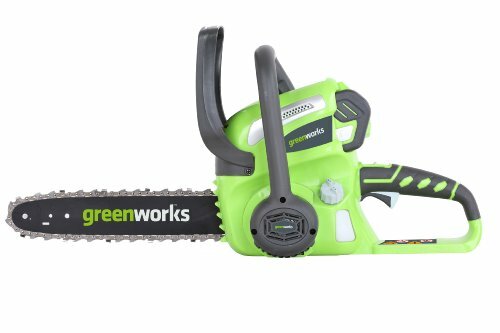 The Greenworks cordless chainsaw provides fade free power with no memory lost once it has been charged. With a 12 inch steel chain the saw blade is large enough for bigger jobs that you might have around the yard. It also has a wrap handle, designed for cutting at different angles, making it easier to use in awkward positions and locations. As well as this, the chainsaw boasts an automatic oiler that provides oil for both the bar and the chain during use. The electric build also means an instant start and an apparent reduction in the level of noise caused by the chainsaw. Similar to the offering from Black+Decker, the chainsaw can be tensioned without tools, making it easy to adapt while you are out on the job. Straight away, you will notice an advantage this saw has over the Black+Decker. The Greenworks cordless chainsaw has a battery life of around an hour for constant use. Plus if you use it while taking breaks, it will last a lot longer. As such, you could complete several jobs without a recharge. The chainsaw offers a similar power level to the Black+Decker and will cut through a tree fifteen inches in diameter. However, due to the size, it is best suited for trees roughly half that size. The chainsaw weighs just 6 lbs making it lightweight enough for longer jobs. Unfortunately, the main issue with this chainsaw is the chain itself. For some people it just will not be strong enough with too fewer teeth. As well as this, you might find there is an issue with chain tension. The chain may need to be manually altered after just a few minutes of use. But at least tools are not required for performing this task. You might also find there’s an issue when trying to cut larger or stronger pieces of wood. Due to the size of the chain and the power of the tool, it would be best suited for green or wet wood. Anything sturdier and you will find the saw is difficult to handle. With a lightweight design and a longer lasting battery, the chainsaw offered by GreenWorks beats the similar model by Black+Decker. However, it won’t be powerful enough for larger jobs around the garden and the constant need to tension the chain might be annoying for some users. 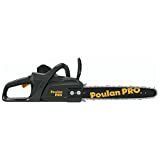 The Poulan Pro is slightly larger than the other two chainsaws we have reviewed here with a 14’’ bar. It is designed for cutting through trees up to around eight inches in diameter. With a brushless motor system, this chainsaw aims to achieve high levels of efficiency and in doing so reduce battery drainage during use. The chainsaw also offers an electric chain break for additional safety. With an automatic oiler. Similar to the other two chainsaws reviewed you can still make sure the chainsaw is always oiled up when in use. The battery life has a similar run time to that of the black+decker lasting forty-five minutes when in permanent use. The Poulan Pro doesn’t pretend to be for bigger tree fells. It’s perfectly suited as a chainsaw for use on trees around the yard and cutting off limbs or branches. While it is not the cheapest chainsaw we have reviewed, it does provide excellent value for money and will be perfect for the little jobs that you might have around the yard and garden. It doesn’t quite have the same power level offered by the Black+Decker, but you also won’t have a problem with oil leaks. The product is well designed and highly durable, so you will be able to rely on it for years. The auto shut off feature is particularly handy for those worried about safety. If it hasn’t been used for a while, the machine will shut off automatically. This reduces the risk of an unfortunate accident while conserving power. It is slightly heavier than something like the Black+Decker however it is also a better quality of build. The saw is well balanced and will be easy to use for anyone completing smaller pruning jobs around the garden. Despite having a shorter battery life than GreenWorks cordless chainsaw, the Poulan Pro makes up for it with a great design that you can trust. The automatic shutoff switch could also mean it will last longer if you are not cutting the entire time. The right cordless electric chainsaw for you will depend on what you’re using it for. 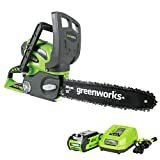 If you need a cordless chainsaw for larger jobs, you may want to opt for the GreenWorks product. This chainsaw has a longer battery life and will cut through larger trees beyond what’s in your backyard. 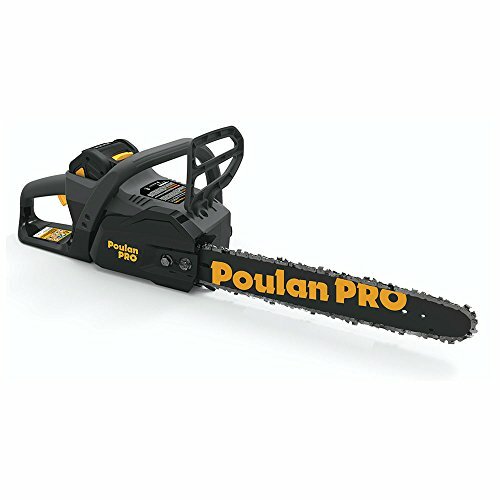 However, for a daily use chainsaw, the Poulan Pro is definitely the best option. It provides great value for money with a saw you can always count on for smaller jobs around the back garden. It will still cut through plenty of smaller trees and is light enough to be used on a regular basis. As such, it comes highly recommended. Particularly, because it doesn’t have the issues with oil leaks and chain issues that plague the other two selections from Black+Decker and GreenWorks. The bottom line is that if you are going to buy a cordless chainsaw, quality has to be a primary concern. You’ll find that with it’s well-balanced design, the Poulan Pro fits the bill here beautifully.